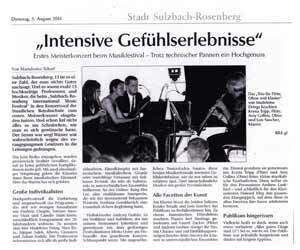 Sulzbach-Rosenberg. Thirteen is a number with a bad reputation. 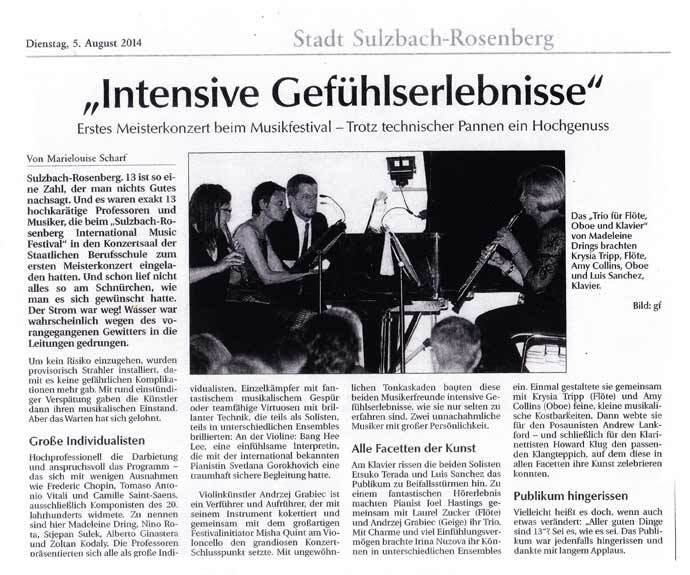 And there were exactly thirteen world-class professors and musicians, who had been invited by the Sulzbach-Rosenberg International Music Festival to the Concert Hall of the State Professional School to perform in their first Masters' Concert. The performances were highly professional and the program demanding. With the exception of Frédéric Chopin, Tomaso Antonio Vitali and Camille Saint-Saëns, it was dedicated entirely to composers of the 20th century: Madeleine Dring, Nino Rota, Stjepan Sulek, Alberto Ginastera and Zoltan Kodály. The professors presented themselves as great individualists, lone warriors with fantastic musical intuition or virtuoso team-players with brilliant technique. Sometimes as soloists, sometimes in various ensembles, they shone: on the violin, Bang Hee Lee, an empathetic interpreter, supported by the divine certainty of internationally renowned pianist Svetlana Gorokhovich's accompaniment. Violinist Andrzej Grabiec is a seducer and an agitator, who teases with his instrument. Together with the festival's formidable director, Misha Quint, on the cello, he gave the concert its grand finale. With unexpected cascades of sounds, these musical friends created intense emotional experiences, such as are rarely to be had. Two inimitable musicians with great personality. On the piano, the two soloists Etsuko Terada and Luis Sanchez brought the audience to storms of applause. Pianist Joel Hastings, along with Laurel Zucker (flute) and Andrjez Grabiec (violin), made their trio into a fantastic musical experience. Irina Nuzova brought her abilities into various ensembles with charm and empathy. Together with Krysia Tripp (flute) and Amy Collins (oboe), she prepared small, musical delicacies. Then she wove a fitting musical background for trombonist Andrew Lankford, and then for clarinetist Howard Klug, upon which they could reveal all the facets of their art. Maybe we should say instead: 'all good things come in thirteens.' Be it as it may. The audience, in any case, was enraptured, gave its thanks with lengthy applause.